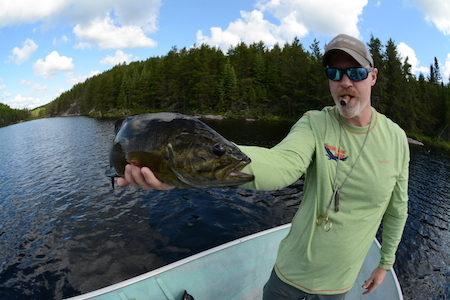 Just spent five days at Hawk Lake Lodge in northwestern Ontario, trying to figure out how to catch walleye on the fly, and spending the rest of the time slamming smallmouth on poppers. In the evenings it was all fun and games with a great cast of characters. When fishing out of Hawk Lake Lodge you get great access to the big main lake, where the big walleyes roam, and daily access to one of more than 18 private lakes that are accessed via portage. Once you complete the short hikes between lakes you find boats waiting for you. It’s a self-guided affair, unless you hire a guide from the lodge, and that allows you to probe the lakes at your free will. And you can fish for as long as you choose. Want breakfast delivered to your room before sunrise. Just say the word. Want to stay out through lunch, as we did each day. Say the word. Want to fish after dinner. Get on out there. We did that and didn’t get off the water until well after dark on a couple occasions. 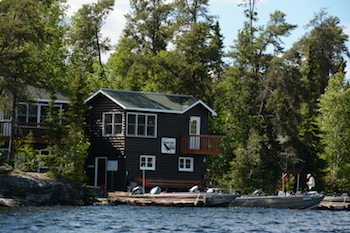 Good fun in the north country with as many options as any lodge in the world has to offer. If you are a walleye or bass guy, with shots for giant pike thrown in on the side, this place is for you. Here are a few images to enjoy. Look for a full story in Fly Rod & Reel’s fall issue. 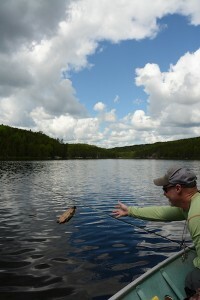 A nice smallmouth from, what else, Bass Lake, one of 30-plus such bass we landed, all on poppers, that day. Like the Bassmaster’s Classic. These boats are fueled and cleaned up and ready to roll for the evening excursion. Crestliners with 50 HP motors. These rolled down the lake and got us where we needed to be. Turtles, too? Ah come on man, quit messing with the turtles. 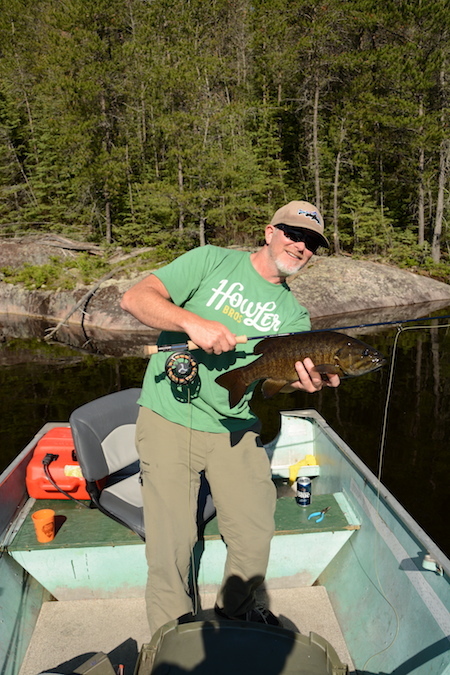 This entry was posted in CANADA, Travel, Warmwater and tagged flyfishing for smallmouth bass, Hawk Lake Lodge, how to catch trophy walleye, Ontario fly fishing, trophy walleye fishing. Bookmark the permalink.